Come see us at the Seattle Boat Show 2019! Visit Milltech Marine at booth C2402 during the Seattle Boat Show from January 25th - February 2nd. Did you miss our "AIS and Beyond" seminar at the Seattle Boat Show? You can download the presentation here. Have you experienced AIS or VHF reception issues and have LED lights onboard? Be sure to read this US Coast Guard advisory to learn more. Check out our latest blog article to see how you can combine AIS, marine navigation, charting and radar using the TZ iBoat app. Improperly programmed AIS transponders are becoming are real safety issue and the USCG is cracking down. See our blog article here for more information. Did you miss us at the 2018 Seattle Boat Show? Milltech Marine attended the 2018 Seattle Boat Show and presented a seminar on "Next Generation AIS Solutions". Click here to download a copy of the presentation. New AIS product range added to Milltech Marine online store! Milltech Marine is now a dealer for em-trak AIS products. Check out our range of new products here. The latest AIS transponder technology is now available! We are proud to announce the availability of the AMEC WideLink B600 Class B SOTDMA AIS Transponder - one of the first transponders built based on the newest AIS standard. This transponder features 5-watt transmit power for greater range as well as SOTDMA technology for better management of transmissions. Check out the product page for more information. Did you miss us at the 2017 Seattle Boat Show? DSC: A Better Way to Hail! Want to use Coastal Explorer with the Vesper XB-8000? See our latest blog article with detailed steps to make your PC-based Rosepoint Coastal Explorer work seamlessly with the Vesper XB-8000 Class B AIS Transponder. Wondering which marine navigation app to load on your iPad? Check out our feature and price comparison chart for popular iPad marine navigation applications. On January 30 2015, the US Coast Guard published their long-anticipated new rules for AIS which go into effect on March 2 2015. For more information, see our resource page here. If placed by 11:00AM PST, Monday through Friday, most orders ship same-day (excluding domestic Class B AIS which must be programmed before shipping). Use our online Shopping Cart to make sure your location is served and to check shipping options and costs. For more information, click here. Please call or email with any questions. AIS VHF Antenna Splitters allow you to share your existing VHF antenna with your AIS receiver or transponder and your VHF radio. Antenna splitters simplify installation and reduce cable runs. Signal loss is minimal (<3dB) and is far outweighed by the advantages of an antenna optimally located at the highest point available (sailboat masthead, power yacht cabin top or arch). NOTE: Splitters designed for use with AIS receivers (e.g. Comar ASR 100 and the Smart Radio splitter) will not work with AIS transponders. 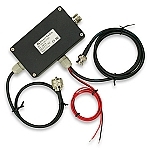 If you are interested in an antenna splitter for use with an AIS transponder, check out the selection here. Want more info on the pros and cons of using an antenna splitter? Check out our blog article here. QUICK TIP: Have a power boat without space for an additional VHF antenna on cabin top or arch? A splitter will help reduce antenna clutter. Placing your AIS antenna too close to another antenna (even if the other antenna is not active) can greatly reduce AIS reception. This makes a splitter a good choice when space is at a premium. These antenna splitters are designed to only work with AIS receivers. These antenna splitters are designed to work with all Class B AIS transponders. © Copyright Milltech Marine. All Rights Reserved.